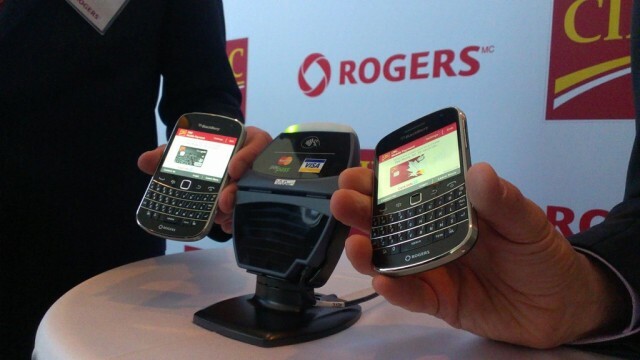 Today Rogers and CIBC are launching what they refer to as “the future of mobile payments in Canada.” Using existing contact-less kiosks at retailers around the country (often provided by Moneris and TD) users can spend up to $50 on NFC-capable BlackBerry devices by connecting their CIBC Visa or Mastercard. CIBC Senior Executive Vice-President David Williamson says that over 5% of Canadians have engaged in some form of smartphone-based mobile banking, and the bank was the first to launch a mobile app, a mobile trading app and, most recently, an iPad app. Rogers is touting over 250,000 NFC-capable devices on the market and is expecting to power up to 750,000 by the end of the year. With the recent standards announcement for mobile payments, this is just the beginning. The idea is simple: by launching a specially-created CIBC app on your NFC-capable BlackBerry smartphone you will be able to make low-cost payments with existing Mastercard or Visa cards. The security comes from a secure Rogers SIM card that will start arriving in new phones in the coming months or, for existing users, in swapping out their existing SIM cards for the “secure” version. The technology is also quite simple: nothing changes in terms of the transfer of information between existing wireless-capable credit cards and this new mobile system. There is a 30-second window to activate the contactless payment before which it will time out, and there is an option of adding a password to the mix, though due to the $50 limit it is not enforced. When the payment system launches later this year it will be initially limited to NFC-capable BlackBerry devices including the Bold 9900, Bold 9790 and Curve 9360. It is in CIBC’s domain to expand the app to Android and, when it comes, to iPhone. Rob Bruce, President of Communications for Rogers, inferred that the technology would eventually come to Apple and its iPhone, though he didn’t explicitly say that NFC would be added to the next version of the hardware. Bruce followed up with a humbling fact: 60% of Rogers customers have smartphones, and he says that within three years virtually every handset it sells will be NFC-capable. Considering that most customers rarely leave their smartphones at home, the ability to pay for most things without having to take out a wallet or swipe a credit card will be a huge benefit to customers. Neither company offered a timeline for the rollout, other than to that “as soon as possible.” Nor would they commit on an expansion — Rogers to other banks, and CIBC to other carriers — though it was implied that this is a non-exclusive agreement. The credit card paired to the app will have to be activated over the phone by CIBC, and if the phone is lost or stolen the SIM card can be shut down immediately, preventing unauthorized payments from being made even if there is no password on the app. Loyalty partners such as Petro Canada and Aeroplan are in on the fun, too, as points will be accumulated the same way as with plastic. So too is the fraud prevention the same, with CIBC monitoring every transaction for familiarity and frequency. It’s too soon to say whether this will change the lives of many Canadians — unlikely in the short-term due to the limited carrier/bank/device rollout — but it’s a step in the right direction. No stickers, no fiddly settings, no mess. Virtually the same experience as using a plastic credit card, and available in thousands of retailers across the country. It’s not difficult to think that within five years smartphone payments will be about as ubiquitous as credit cards are today.